Make No Covenant With Them. Daily we are told by the Liberal Left here in Israel that we can make peace with the “Palestinians” that suicide suggestion is backed up by the Obama Administration and Kerry continues to put all the pressure possible on Israel to commit suicide, saying that Israel must agree to the 1967 borders, when in fact there is no such border and never has been. Like they say if you repeat a lie often enough it will begin to be a fact, or what will be perceived as a fact. Like the word “Palestinians” that was never used in regards to a State until after the 1967 war. When Gaza was controlled by Egypt no one ever thought as Palestinian State. The so called, West Bank, (Judea and Samaria) when it was under Jordan’s control there was no thought of it being a “Palestinian State”. In fact as you have most likely read before there has never been a time in History when there was a Palestinian State with a Palestinian Government. 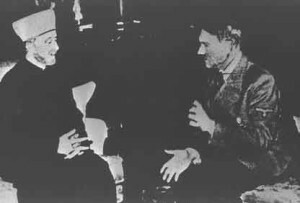 The same Nazi spirit today lives in the twisted minds of the Muslim Arab World in fact it can be traced back to Ishmael the son of an Egyptian women. We read in God’s Word. Gen. 16:12 And he will be a wild man; his hand will be against every man, and every man’s hand against him; and he shall dwell in the presence of all his brethren. We read in God’s Word how to deal with Islamic Terrorist. Deut. 7:2 And when the LORD thy God shall deliver them before thee; thou shalt smite them, and utterly destroy them; thou shalt make no covenant with them, nor shew mercy unto them. We have known by God’s Word that in the end days the Islamic Terrorists would be beheading Christians for we read in the Word..
Rev.20:4 And I saw thrones, and they sat upon them, and judgment was given unto them: and I saw the souls of them that were beheaded for the witness of Jesus, and for the word of God, and which had not worshipped the beast, neither his image, neither had received his mark upon their foreheads, or in their hands; and they lived and reigned with Christ a thousand years. We could spend several pages in Matt. 24 or Luke 21 just to mention a couple chapters in the Bible that tell us we are without any doubt in the last days, but if you want proof positive look at what sets in the White House. I am praying daily that God will touch some in the West and the East to rescue Jews in the coming days and find ways to bring them to Israel, or if that isn’t possible to bring them to a Greek Island or Cyprus where we can have the chance to pick them up by boats and bring them home to Israel. Some times I feel a little of how Noah must have felt, for many tell me that it will not be possible when the missiles begin to fly. But I know it can and will be done for God told me so. All I do know is we must be preparing and ther is still so much that needs to be done, and we need your help and we need it today. The two things we need mostly is the needed finances to operate the boats we now have, the provisions and logistics are expensive the fuel alone cost many thousands daily. We have begun to prepare food here in Israel for they will not be arriving in a peaceful time and going shopping will not be possible, we are preparing. Note: I want to apologize for not putting a graphic warning for the terrible pictures in the last article.